They worked together early in their careers, and it is not easy to distinguish their shares in, for example, the cycle of frescos in the Palazzo Fava in Bologna (c.1583-84). In the early 1580s they opened a private teaching academy, which soon became a center for progressive art. It was originally called the Accademia dei Desiderosi ('Desiderosi' meaning 'desirous of fame and learning'), but later changed its name to Academia degli Incamminati (Academy of the Progressives). In their teaching they laid special emphasis on drawing from the life (all three were outstanding graphic artists) and clear draughtsmanship became a quality particularly associated with artists of the Bolognese School,notably Domenichino and Reni, two of the leading members of the following generation who trained with the Carracci. They continued working in close relationship until 1595, when Annibale, who was by far the greatest artist of the family, was called to Rome by Cardinal Odoardo Farnese to carry out his masterpiece, the decoration of the Farnese Gallery in the cardinal's family palace. He first decorated a small room called the Camerino with stories of Hercules, and in 1597 undertook the ceiling of the larger gallery, where the theme was The Loves of the Gods, or, as Bellori described it, "human love governed by Celestial love". Although the ceiling is rich in the interplay of various illusionistic elements, it retains fundamentally the self-contained and unambiguous character of High Renaissance decoration, drawing inspiration from Michelangelo Sistine Ceiling and Raphaefrescos in the Vatican Loggie and the Farnesina. The full untrammelled stream of Baroque illusionism was still to come in the work of Cortona and Lanfranco, but Annibale's decoration was one of the foundations of their style. Throughout the 17th and 18th centuries the Farnese Ceiling was ranked alongside the Sistine Ceiling and Raphael's frescos in the Vatican Stanze as one of the supreme masterpieces of painting. It was enormously influential, not only as a pattern book of heroic figure design, but also as a model of technical procedure; Annibale made hundreds of drawings for the ceiling, and until the age of Romanticism such elaborate preparatory work became accepted as a fundamental part of composing any ambitious history painting. In this sense, Annibale exercised a more profound influence than his great contemporary Caravaggio, for the latter never worked in fresco, which was still regarded as the greatest test of a painter's ability and the most suitable vehicle for painting in the Grand Manner. Annibale's other works in Rome also had great significance in the history of painting. Pictures such as Domine, Quo Vadis? (National Gallery, London, c.1602) reveal a striking economy in figure composition and a force and precision of gesture that had a profound influence on Poussin and through him on the whole language of gesture in painting. He developed landscape painting along similar lines, and is regarded as the father of ideal landscape, in which he was followed by Domenichino (his favorite pupil), Claude, and Poussin. The Flight into Egypt (Doria Gallery, Rome, c.1604) is Annibale's masterpiece in this genre. In his last years Annibale was overcome by melancholia and gave up painting almost entirely after 1606. When he died he was buried accordingly to his wished near Raphael in the Pantheon. It is a measure of his achievement that artists as great and diverse as Bernini, Poussin and Rubens found so much to admire and praise in his work. Annibale's art also had a less formal side that comes out in his caricatures (he is generally credited with inventing the form) and in his early genre paintings, which are remarkable for their lively observation and free handling (The Butcher's Shop, Christ Church, Oxford). Agostino assisted Annibale in the Farnese Gallery from 1597 to 1600, but he was important mainly as a teacher and engraver. His systematic anatomical studies were engraved after his death and were used for nearly two centuries as teaching aids. He spent the last two years in Parma, where he did his own "Farnese Ceiling", decorating a ceiling in the Palazzo del Giardino with mythological scenes for Duke Ranuccio Farnese. It shows a meticulous but somewhat spiritless version of his brother's lively Classicism. Ludovico left Bologna only for brief periods and directed the Carracci academy by himself after his cousins had gone to Rome. His work is uneven and highly personal. Painterly and expressive considerations always outweigh those of stability and calm Classicism in his work, and at its best there is a passionate and poetic quality indicative of his preference for Tintoretto and Jacopo Bassano. His most fruitful period was 1585-95, but near the end of his career he still produced remarkable paintings of an almost Expressionist force, such as the Christ Crucified above Figures in Limbo (Sta Francesco Romana, Ferrara, 1614). The Caracci fell from grace in the 19th century along with all the other Bolognese painters, who were one of Ruskin's pet hates and whom he considered (1847) had "no single virtue, no color, no drawing, no character, no history, no thought". They were saddled with the label "eclectic" and thought to be ponderous and lacking in originality. Their full rehabilitation had to wait until the second half of the 20th century (the great Carracci exhibition held in Bologna in 1956 was a notable event), but Annibale has now regained his place as one of the giants of Italian painting. 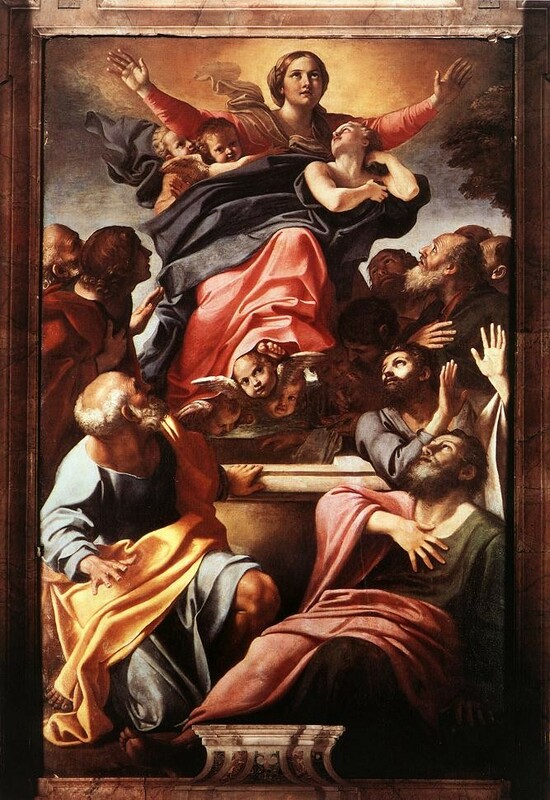 The Assumption of the Virgin is in the famous Cerasi Chapel of the church of Santa Maria del Popolo of Rome. 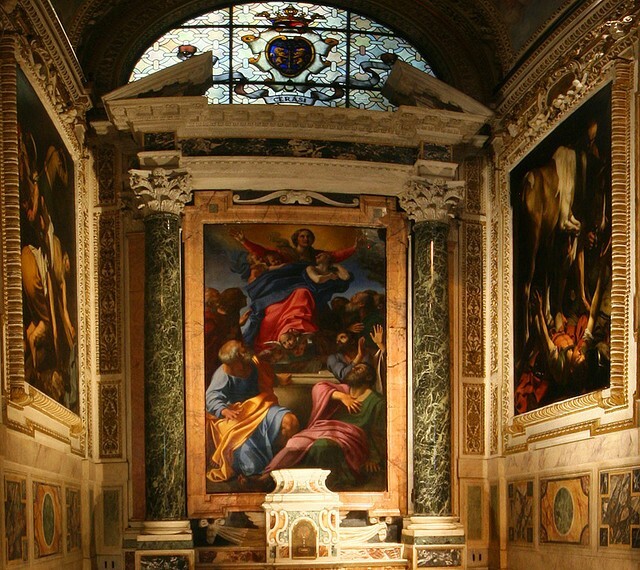 Carracci competed with the major artists for this altarpiece, the prize commission for the chapel. Some believe it is one of his less satisfactory arrangements. The Virgin awkwardly rises through a cramped crowd of apostles, levitated by half-a dozen cherubim. The canvas was somewhat overshadowed by the two famous contemporary Caravaggio canvases: the The Conversion of Saint Paul on the Road to Damascus and The Crucifixion of Saint Peter on the two side walls. While both painters were important in the development of Baroque art, the contrast is striking: Carracci's Virgin glows with light, but Caravaggio's St. Paul is surrounded by menacing shadows and figures.